Venkateswara Temple is a landmark Vaishnavite temple situated in the hill town of Tirumala at Tirupati in Chittoor district of Andhra Pradesh, India. The Temple is dedicated to Lord Sri Venkateswara, an incarnation of Vishnu, who is believed to have appeared here to save mankind from trials and troubles of Kali Yuga. Hence the place has also got the name Kaliyuga Vaikuntham and the Lord here is referred to as Kaliyuga Prathyaksha Daivam. The temple is also known by other names like Tirumala Temple, Tirupati Temple, Tirupati Balaji Temple. Lord Venkateswara is known by many other names: Balaji, Govinda, and Srinivasa. Tirumala Hills are part of Seshachalam Hills range. The hills are 853 metres (2,799 ft) above sea level. The Hills comprises seven peaks, representing the seven heads of Adisesha. The temple lies on the seventh peak -Venkatadri, on the southern banks of Sri Swami Pushkarini, a holy water tank. Hence the temple is also referred to as "Temple of Seven Hills". Tirumala town covers about 10.33 sq mi (26.75 km2) in area. The Temple is constructed in Dravidian architecture and is believed to be constructed over a period of time starting from 300 AD. The Garbagruha (Sanctum Sanctorum) is called AnandaNilayam. The presiding deity, Venkateswara, is in standing posture and faces east in Garbha gruha. The temple follows Vaikhanasa Agama tradition of worship. The temple is one of the eight Vishnu Swayambhu Kshetras and is listed as 106th and the last earthly Divya Desam. The Temple premises had two modern Queue complex buildings to organize the pilgrim rush, Tarigonda Vengamamba Annaprasadam complex for free meals to Pilgrims, hair tonsure buildings and a number of pilgrim lodging sites. It is the richest temple in the world in terms of donations received and wealth. The temple is visited by about 50,000 to 100,000 pilgrims daily (30 to 40 million people annually on average), while on special occasions and festivals, like the annual Brahmotsavam, the number of pilgrims shoots up to 500,000, making it the most-visited holy place in the world. [not in citation given]. In 2016, it was reported that 27.3 million pilgrims visited the temple. There are several legends associated with the manifestation of the Lord in Tirumala. According to one legend, the temple has a murti (deity) of Lord Venkateswara, which it is believed shall remain here for the entire duration of the present Kali Yuga. During Dvapara Yuga, Adisesha resided on earth as Seshachalam Hills after losing a contest with Vayu. According to Puranas, Tirumala is regarded as Adivaraha Kshetra. After killing Hiranyaksha, Adivaraha resided on this hill. Sri Venkatachala Mahatyam is the widely accepted legend over Tirumala Temple. During Kali Yuga, Narada advised Rishis who were performing Yajna to decide who could be given the fruits of yagna among Trimurtis. Bhrigu was sent to test Trimurtis. The sage who had an extra eye in the sole of his foot visited Lord Brahma and Lord Shiva and went unnoticed in both these locations. At last he visited Vishnu and the lord acts as if he had not noticed Bhrigu. Getting angered by this act, sage Bhrigu kicked Lord Vishnu in the chest, to which Vishnu did not react and instead apologized to the Sage by massaging his feet. During this act, he squashed the extra eye that was present in the sole of Bhrigu's foot. However Lakshmi finds it as an insult and had left Vaikuntam onto Earth to Kolhapur and started meditating. Lord Vishnu bore human form as Srinivasa, left Vaikuntam, in search of Lakshmi, reached Tirumala Hills and started meditating. Lakshmi came to know about the condition of Srinivasa and prayed to Siva and Brahma. Siva and Brahma then converted themselves into Cow and Calf and Goddess Lakshmi had handed over the cow and calf to Chola king ruling over Tirumala Hills at that time. The Cow would provide milk to Srinivasa daily while it was taken for grazing. One day Cowherd saw this and tried to beat the Cow with staff but Lord Srinivasa had borne the injury. Getting angered by this Srinivasa had cursed the Chola king to become a Demon as dharma says Servants sin should be borne by Kings. The king prayed for mercy after which Srinivasa said to him, that the King should take next birth as Akasaraja and should perform marriage of his daughter Padmavati with Srinivasa. Lord Srinivasa went to his mother Vakula Devi on Tirumala hills and stayed there for a while. After curse Chola king took rebirth as Akasaraja and he had a daughter named Padmavati who was born in the Padmapushkarini situated at present day Tiruchanur in Andhra Pradesh. Lord Srinivasa married Padmavati at present day Narayanavanam in Andhra Pradesh and will return to Tirumala Hills. After few months Goddess Lakshmi had come to know about the marriage of Srinivasa with Padamavati and went to Tirumala hills to question Srinivasa. It is said that the Lord srinivasa turns into Stone right when he was encountered by Lakshmi and Padmavathi. Lord Brahma and Shiva appear before the confused queens and explain the main purpose behind all this - The Lord's desire to be on the 7 hills for the emancipation of mankind from the perpetual troubles of Kali Yuga. Goddesses Lakshmi and Padmavathi also turn into stone deities expressing their wish to be with their Lord always. Lakshmi stays with Him on His Chest on the left side while Padmavathi rests on His Chest's right side. The first recorded endowment was made by Pallava queen Samavai in the year 966 CE. She donated many jewels and two parcels of land (one 10 acres and other 13 acres) and ordered to use the revenues generated from that land to be used for the celebration of major festivals in the temple. The Pallava dynasty (9th century), the Chola dynasty (10th century), and Vijayanagara pradhans (14th and 15th centuries) were committed devotees of Lord Venkateswara. The temple gained most of its current wealth and size under the Vijayanagara Empire, with the donation of diamonds and gold. In 1517, Vijayanagara Emperor Krishnadevaraya, on one of his many visits to the temple, donated gold and jewels, enabling the Ananda Nilayam (inner shrine) roofing to be gilded. After the decline of Vijayanagara Empire, leaders from states such as the Kingdom of Mysore and the Gadwal Samsthanam worshiped as pilgrims and gave ornaments and valuables to the temple. Maratha general Raghoji I Bhonsle (died 1755) visited the temple and set up a permanent administration for the conduct of worship in the temple. After the dusk of Vijayanagara Empire, the temple went into the hands of Golconda in July 1656 and then it was under the French for a short period of time and under Nawab of Carnatic till 1801 CE. With the advent of British during the early 19th century, the management of the temple passed to hands of East India Company, who accorded special status to temple and avoided interference in temple activities. Madras government passed Regulation seven of 1817, which passed the temple to Board of Revenue through collector of North Arcot District. In 1821, Bruce of England had drawn rules for the management of Temple which is referred to as Bruce's Code. In 1843 the East India Company transferred the Administration of Temple along with other Temples in Tirupati to Mahants of Hathiramji Muth, who acted as Vicaranakartas. It was under the rule of Mahants for six generations until 1933 when Tirumala Tirupati Devasthanams was formed as a result of the TTD Act in 1933. The Act of 1933 was superseded by Madras Hindu Religious and Charitable Endowment Act of 1951. Again in 1966, the temple was placed under direct control of Andhra pradesh State Endowments Department, with Andhra Pradesh Charitable and Hindu Religious Institutions and Endowments act. In 1979, act of 1966 was rolled back with new Tirumala Tirupati Devasthanams act, where temple administration was vested to a committee consisting of Executive officer, Chairman and two other members nominated by Government of Andhra Pradesh. The temple bears as many as 640 inscriptions in Kannada, Sanskrit, Tamil, Telugu languages. There is a unique collection of about 3000 copper plates on which the Telugu Sankirtanas of Tallapaka Annamacharya and his descendants are inscribed. This collection forms a valuable source of material for a historical linguist in Telugu apart from its importance to musicologists. Tirumala Tirupati Devasthanams(TTD) is the trust board which oversees and manages the operations of Tirumala Venkateswara Temple. It is operated by a Board of Trustees that has increased in size from five (1951) to eighteen (2015) through the adoption of Acts. The daily operation and management of TTD is the responsibility of an executive officer who is appointed by the Government of Andhra Pradesh. The temple attracts approximately 75,000 pilgrims every day. The annual budget, estimated at INR 2530.10 Crores for the financial year 2015-16, runs charitable trusts whose funds are derived from the budget and donations from the devotees. The annual income is estimated at INR 10 billion in 2008. Most of its income is derived from the donations in SriVari Hundi. Devotees donate to the TTD, which runs into millions of rupees. TTD, the organisation running the welfare of the temple, runs various charitable trusts, whose funds are derived from the budget and donations from the devotees. There are three Dwarams(entrances) which lead to Garbhagriha from outside. Mahadwaram also known as padikavali is the first entrance which is provided through Mahaprakaram(outer compound wall). A 50 feet, five storied Gopuram(Temple tower) is constructed over this Mahadwaram with seven Kalasams at its apex. Vendivakili(Silver Entrance) also known as Nadimipadikavali is the second entrance and is provided through SampangiPrakaram(Inner compound wall). A three storied Gopuram is constructed over Vendivakili with seven Kalasams at its apex. Bangaruvakili(Golden Entrance) is the third entrance which will lead into Garbhagriha. There are two tall copper images of the Dvarapalakas Jaya-Vijaya on either side of this door. The thick wooden door is covered with gold gilt plates depicting the Dasavathaaram of Vishnu. Circumambulation around Sanctum sanctorum in the temple or deities is called Pradakshinam. There are two circumbulation paths in the temple. The first one is area between Mahaprakaram and sampangiprakaram. This path known as Sampangipradakshinam has many Mandapas, Dwajasthambam, Balipeetam, Kshetrapalika sila, prasadam distribution area etc. The Vimanapradakhinam is the second pradakshinam, which circumbulates Ananda Nilayam Vimanam. This path has sub-shrines dedicted to Varadaraja and Yoga Narasimha, Potu(main kitchen), Bangaru Bavi(golden well), Ankurarpana Mandapam, Yagasala, Nanala (coins and Notla (Paper notes) Parkamani, Almyrah of Sandal paste (Chandanapu ara), cell of records, Sannidhi Bhashyakarulu, Lords’s hundi and the seat of Vishvaksena. Ananda Nilayam Vimanam is the main Gopuram constructed over 'Garbhagriha. This is a three storied Gopuram and has single Kalasam at its apex. It was covered with gilt copper plates and covered with a golden vase. There are many deities of gods carved over this Gopuram. On this Gopuram, there is a deity of Venkateswara known as "Vimana Venkateswara" which is believed to be exact replica of deity inside Garbhagriha. Venkateswara, an avatar of Vishnu is the presiding deity of the temple. It is believed that the Moolavirat is Swayambhu(self manifested). As per Vaikanasa agamas, Venkateswara is represented by five deities(berams) including the Moolavirat which are together referred to as Pancha beramulu(Pancha means five;Beram means Deity). The five deities are Dhruva Beram(Moolavar), Kautuka Beram, Snapana Beram, Utsava Beram, Bali Beram. All the pancha berams are placed in the Garbha griha under Ananda Nilayam Vimanam. Moolavirat or Dhruva Beram- In the centre of Garbha griha, under the Ananda Nilayam Vimana, the Moolavirat of Venkateswara is seen in standing posture on lotus base, with four arms, two holding Shanka and Chakra and one in Varada posture and other in Kati posture. This deity is considered the main source of energy for the temple and adorns with Namam and jewels including vajra kiritam(diamond crown), Makarakundalams, Nagabharanam, Makara Kanti, Saligrama haram, Lakshmi haram. Venkateswara's consort, Lakshmi will be staying on the chest of the Moolavirat as Vyuha Lakshmi. Bhoga Srinivasa or Kautuka Beram -- This is a small one-foot (0.3 m) silver deity which was given to the temple in 614 AD by Pallava Queen Samavai for conducting festivals. Bhoga Srinivasa is always placed near the left foot of Moolavirat and is always connected to the main deity by a holy Sambandha Kroocha.This deity will receive many daily sevas(pleasures) on behalf of Moolavar and hence known as Bhoga Srinivasa(In Telugu: Bhoga means Pleasure). This deity receives Ekanthaseva daily and SahasraKalasabhisheka on Wednesdays. Malayappa swami or Utsava Beram - Malayappa is the processional deity(Utsava beram) of the Temple and is always flanked by the deities of his consorts Sridevi and Bhudevi. This deity receives all festivals like Brahmotsavams, Kalyanotsavam, Dolotsavam, Vasanthotsavam, Sahasra deepalankarana seva, Padmavati parinyotsavams, pushpapallaki, Anivara asthanam, Ugadi asthanam etc. Koluvu Srinivasa or Bali Beram- Koluvu Srinivasa represents Bali Beram. 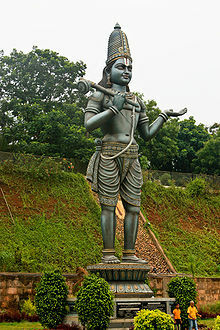 Koluvu Srinivasa is regarded as the guardian deity of the temple that presides over its financial and economic affairs. Daily Koluvu seva(Telugu: Koluvu means engaged in) will be held in the morning, during which, the previous day's offerings, income, expenditures are notified to this deity, with a presentation of accounts. Panchanga sravanam also will be held at the same time during which that particular days Tithi, sunrise and sunset time, nakshatra are notified to the Venkateswara. Along with Pancha berams, garbha griha also hosts panchaloha deities of Sita, Rama, Lakshmana, Rukmini, Sri Krishna swamy, Chakratalwar. The temple hosts the deities of Garuda, Yoga Narasimha, Varadaraja, Kubera, Bedi Anjaneya in their respective sub-shrines. The temple also host the deities of Anantha, Garuda, Viswaksena, Sugriva, Ramanuja. Vimana Venkateswara is the exact replica icon of Venkateswara carved on the Ananda Nilayam Viamana's second tier north west corner. The temple follows "Vaikhanasa Agama" tradition of worship, which is believed to be revealed by Sage Vikhanasa and is propagated by his disciples Atri, Bhrigu, Marichi, Kasyapa. Vaikhanasa is one of the principal traditions of Hinduism and primarily worships Vishnu (and his associated Avatars) as the Supreme God. This ancient texts recommends six times puja(worship) a day for Vishnu, of which minimum one puja is mandatory. Rituals are classified as daily, weekly and periodical. The daily sevas in Temple(in order of occurrence) include Suprabhata Seva, Thomala Seva, Archana, Kalyanotsavam, Dolotsavam (Unjal Seva), Arjita Brahmotsavam, Arjita Vasantotsavam, Sahasra Dipalankarana Seva, Ekanta Seva. Weekly sevas of the Temple include Vishesha Pooja on Monday, Ashtadala Pada Padmaradhana on Tuesday, Sahasra Kalasabhishekam on Wednesday, Tiruppavada Seva on Thursday, Abhishekam and Nijapada Darshanam on Friday. There are no weekly sevas on Saturday and Sunday. Periodical rituals include Jyesthabhishekam, Aaniwara Asthanam, Pavithrotsavam, Koil Alwar Tirumanjanam. The world-famous "Tirupati Laddu" is given at Tirumala Temple as prasadam. Tirupati Laddu had got Geographical indication tag which entitles only Tirumala Tirupati Devasthanams to make or sell it. Many other prasadams are also offered to Venkateswara which will then be distributed to devotees, including daddojanam (curd rice), puliohora (tamarind rice), vada and chakkera-pongali (sweet pongal), miryala-pongali, Appam, Paayasam, Jilebi, Muruku, Dosa, seera (kesari), Malhora. Free meals are given daily to the pilgrims. On Thursdays, the Tirupavada seva is conducted, where food items are kept as naivedyam to Lord Venkateswara. More than 50,000 to 100,000 pilgrims have Darshan of preisding deity, Lord Venkateswara, while on special occasions and festivals, like the annual Brahmotsavams, the number of pilgrims visiting the temple shoots up to 500,000, making it the most-visited holy place in the world. To manage the huge number of Devotees visiting the temple, Tirumala Tirupati Devasthanam constructed two Vaikuntam Queue Complexes: one in the year 1983 and the other in the year 2000. Vaikuntam Queue complexes have rooms where Devotees can sit and wait until their turn for Darshan. According to tradition, it is important for a devotee to have darshan of Bhuvaraha swamy temple lying on the northern banks of Swami Pushkarini before having Darshan of Lord Venkateswara in the main temple. Recently, the administration introduced a separate queue for pedestrian pilgrims. Free but limited number of biometric tokens are issued for the pilgrims to access this special queue. Tokens are provided on a first-come, first-served basis. The pilgrims can worship Lord Venkateswara on the allotted time slots issued in the token. There are two entry points for the foot-path pilgrims: Alipiri Mettu and Srivari Mettu. Alipiri Mettu is open round the clock, whereas Srivari Mettu is open from 6am - 6pm. Many devotees have their head tonsured as "Mokku", an offering to God. The daily amount of hair collected is over a ton. As per legend, when Lord Venkateswara was hit on his head by a shepherd, a small portion of his scalp became bald. This was noticed by Neela Devi, a Gandharva princess. She felt "such an attractive face should not have a flaw". Immediately, she cut a portion of her hair and, with her magical power, implanted it on his scalp. Lord Venkateswara noticed her sacrifice. As hair is a beautiful asset of the female form, he promised her that all his devotees who come to his abode would offer their hair to him, and she would be the recipient of all the hair received. Hence, it is believed that hair offered by the devotees is accepted by Neela Devi. The hill, Neeladri, one of the seven hills, is named after her. As per legend, it is believed that Srinivasa had to make arrangements for his wedding. Lord Kubera credited money to Lord Venkateswara (a form of the god Vishnu) for his marriage with Padmavathi. Srinivasa sought a loan of one crore and 11.4 million (11,400,000) coins of gold from Kubera and had Viswakarma, the divine architect, create heavenly surroundings in the Seshadri hills. Together, Srinivasa and Padmavathi lived for all eternity while Goddess Lakshmi, understanding the commitments of Lord Vishnu, chose to live in his heart forever. In remembrance of this, devotees go to Tirupati to donate money in Venkateswara's hundi (donation pot) so that he can pay it back to Kubera. The hundi collections go as high as 22.5 million INR a day. In the Thulabaram ritual, a devotee sits on a pan of a weighing balance and the other pan is filled with materials greater than the weight of the devotee. Devotees usually offer sugar, jaggery, tulsi leaves, banana, gold, coins. This is mostly performed with newborn babies or children. Tirumala Sri Venkateswara Temple is a paradise of Festivals where over 433 festivals are being observed in 365 days of a year suiting the title "Nitya Kalyanam Paccha Toranam" where every day is a festival. Sri Venkateswara Brahmotsavams, a nine-day event, which is celebrated every year during month of October, is the major event of Sri Venkateswara Temple. During brahmotsavams the processional deity Malayappa along with his consorts SriDevi and BhuDevi, is taken in a procession in four mada streets around the temple on different vahanams. Vahanams include Dwajarohanam, Pedda Sesha Vahanam, Chinna Sesha Vahanam, Hamsa Vahanam, Simha Vahanam, Muthaypu pandiri Vahanam, Kalpavriksha Vahanam, Sarva Bhoopala Vahanam, Mohini Avataram, Garuda Vahanam, Hanumantha Vahanam, Swarna Rathotsavam(Golden Chariot), Gajavahanam, Rathotsavam(Chariot), Ashwa Vahanam, Chakra Snanam. During Brahmotsavams, The temple will witness lakhs of devotees particularly on Garuda vahanam. Vaikunta Ekadasi, the day on which it is believed that Vaikunta Dwarams will be opened and the most important Vasihnavite festival, is celebrated with grandeur in Tirumala. The Tirumala Venkateswara Temple will be flooded with devotees on a single day with numbers reaching up to 1.5 lakhs, to have a darshan of Venkateswara through special entrance which encircles inner sanctum called "Vaikunta Dwaram". Rathasapthami is another festival, celebrated during February, when Lord Venkateswara's processional deity(Malayappa) is taken in a procession around the temple on seven different vahanams starting from early morning to late night. The other annual festivals include Rama Navami, Janmashtami, Ugadi, Teppotsavam(Float Festival), Sri Padmavati Parinayotsavams, Pushpa yagam, Pushpa pallaki, Vasanthotsavam (spring festival) conducted in March–April, were celebrated with great splendor. Tallapaka Annamacharya (Annamayya), the poet saint of 14th century, one of the greatest Telugu poets and a great devotee of Lord Venkateswara, had sung 32000 songs in praise of Lord Venkateswara. All his songs which are in Telugu and Sanskrit, are referred to as Sankirtanas and are classified as Sringara Sankirtanalu and Adhyatma Sankirtanalu. Varadaraja Temple is a subshrine in Tirumala Venkateswara Temple dedicated to Vararaja Swamy an incarnation of Vishnu. It is not known when this deity was installed. The shrine is located in Vimanapradakshinam, towards left of Vendivakili(silver entrance) while entering temple. The stone deity is sitting posture facing west. Yoga Narasimha Temple is a sub-shrine dedicated to Narasimha Swamy an lion headed fourth-incarnation of Vishnu. The shrine is said to have been built between 1330 A.D. – 1360 A.D and is located in Vimanapradakshinam, towards right of Vendivakili(silver entrance) while entering temple. The deity is in sitting-meditating posture facing west. A small shrine dedicated to Garuda the vehicle of Lord Venkateswara is situated exactly opposite to the Bangaruvakili(Golden Entrance) of Jaya-Vijaya. This sub-shrine is part of Garudamandapam. The Garuthmantha deity is six feet tall and faces west looking towards Lord Venkateswara inside Garbhagriha. Bhuvaraha Swamy Temple is the temple dedicated to Varaha an incarnation of Vishnu. This temple is believed to be older than Sri Venkateswara Temple. The temple lies on the Northern Banks of Swami Pushkarini. As per tradition, at first Naivedyam will be offered to Bhuvaraha Swamy before offering it to Lord Venkateswara in main Temple. And also as per tradition, devotees should have the darshan of Lord Bhuvaraha swamy before Lord Venkateswara. Bedi-Anjaneya Temple is the sub-shrine dedicated to Lord Hanuman. The temple lies exactly opposite to the Mahadwaram near Akhilandam(place where coconuts are offered). The deity in this temple has both of his hands handcuffed(Telugu Language:Bedilu). Vakulamatha is the mother of Lord Venkateswara. There is statue dedicated to her in the main temple just ahead of Varadaraja shrine. 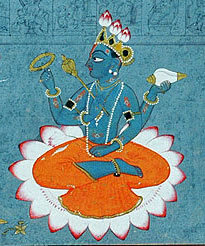 The deity is in sitting posture. As per legend, she supervises the preparation of food that is to be offered to her son. For this reason a hole is made to the wall which separates Vakulamatha sannidhi and Srivari potu(Kitchen). There is a sub-shrine dedicated to Lord Kubera within the Vimanapradakshina. The deity lies to the right side of Garbhagriha and faces south towards preciding deity. The Shrine of Sri Ramanuja is located adjacent to the northern corridor of the Vimana Pradakshinam. It is also known as the Bhashyakara Sannidhi. The shrine was built around in the 13th century A.D.
Ramanuja (1017–1137)  the most important Acharya of Sri Vaishnavism. was responsible for managing the worshipping procedures and other affairs of the Sri Venkateswara temple. He is credited for gifting the holy conch and the discus, the weapons of Vishnu during his visit. So he is considered as 'Acharya'(Guru or teacher) to the Lord himself. He established the Pedda Jeeyar Matam. He has a sannidhi(shrine) inside the temple. Sri Tallapaka Annamacharya (or Annamayya) (22 May 1408 – 4 April 1503) was the official songmaster of the Tirumala Venkateswara Temple, and a Telugu composer who composed around 36000 keertanas, many of which were in praise of Venkateswara, the presiding deity of the temple. The temple is considered one of the eight Swayambhu Kshetras of Vishnu where presiding deity is believed to have manifested on its own. Seven other temples in the line are Srirangam Ranganathaswamy temple, Bhu Varaha Swamy temple, and Vanamamalai Perumal Temple in South India and Saligrama in Nepal, Naimisaranya, Pushkar and Badrinath Temple in North India. The temple is revered by Alvars in Divya Prabandham. The temple is classified as a Divyadesam, one of the 108 Vishnu temples that are mentioned in these books. The benefits acquired by a pilgrimage to Venkatachala are mentioned in the Rig Veda and Asthadasa Puranas. In these epics, Sri Venkateswara is described as the great bestower of boons. There are several legends associated with the manifestation of the Lord at Tirumala. There are many ancient temples nearby Tirumala. 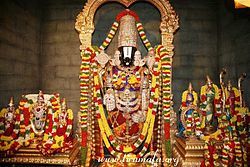 Sri Padamavathi Temple is temple dedicated to Padmavathi, the wife of Venkateswara, situated at Tiruchanur which is 5 km from Tirupati. Srikalahasteeswara Temple is the temple dedicated to Lord Shiva which represents "Vayu"(air) form of elements of Nature, is situated at Srikalahasti which is 38 km from Tirupati. Sri Varasiddhi Vinayaka Temple, situated at Kanipakam town, is a 10th-century Temple dedicated to Lord Vinayaka at 75 km from Tirupati. Other than these, temples like Govindaraja Temple, Kalyana Venkateswara Temple(Srinivasa Mangapuram), Kodandarama Temple, Kapila Theertham are situated within the Tirupati city. ^ Alexandra Mack. Spiritual Journey, Imperial City: Pilgrimage to the Temples of Vijayanagara. Vedams eBooks (P) Ltd, 2002 - Hindu pilgrims and pilgrimages - 227 pages. p. 80. ^ a b "NDTV Report". Retrieved 13 September 2007. ^ a b "Ghazal programme at Tirumala temple". The Hindu. Chennai, India. 30 September 2003. ^ "2.73 cr devotees visited Tirumala last year: TTD". The Times of India. Hyderabad, India. 7 January 2017. ^ a b c d "Tirumala Tirupati Devasthanams-Temple Legend". ^ Feminism and World Religions 1999, p. 48. ^ Dr. N.Ramesan (1981). The Tirumala Temple. Tirumala: Tirumala Tirupati Devasthanams. ^ "Tirumala Tirupati Devasthanams: Temple History". Archived from the original on 12 April 2012. Retrieved 15 July 2011. ^ a b c V.K, Bhaskara Rao (1992). Organisational and Financial Management of Religious Institutions: With Special Reference to Tirumala Tirupati Devasthanams (TTD). Deep and Deep Publications. p. 52, 53. ISBN 81-7100-441-5. ^ Koutha, Nirmala Kumari (1 January 1998). History of the Hindu Religious Endowments in Andhra Pradesh. Northern Book Centre. p. 124. ISBN 81-7211-085-5. ^ a b c Koutha, Nirmala Kumari (1 January 1998). History of the Hindu Religious Endowments in Andhra Pradesh. Northern Book Centre. p. 136. ISBN 81-7211-085-5. ^ "New TTD Board Members to Take Oath on May 2". Retrieved 31 July 2015. ^ Jatania, Prachi (2 November 2006). "Tirumala, the epicentre of faith". CNN-IBN. Retrieved 15 July 2011. ^ "TTD approves annual budget for the year 2015-16". ^ "Tirumala Tirupati Devasthanams: Social Service". Retrieved 15 July 2011. ^ a b c d e Sri Venkateshwara. Shantha Nair. ^ a b "Tiruppavai to replace Suprabhata Seva". times of india. 8 December 2016. Retrieved 27 July 2018. ^ a b "Much awaited Kaisika Dwadasi falls on November 11". times of india. 6 November 2016. Retrieved 27 July 2018. ^ a b "Fervour marks 'Kaisika Dwadasi' at Tirumala". The Hindhu. 2 December 2016. Retrieved 27 July 2018. ^ "Tirumala Tirupati Devasthanams-Arjitha Sevas". Retrieved 18 August 2015. ^ "Record sale of Tirupati laddoos". The Times of India. 7 May 2007. ^ "Tirumala Tirupati Devasthanams-Sri Bhu Varaha Swamy Temple". ^ "Early closure of Srivari Mettu footpath mooted". The Hindu. Retrieved 20 August 2017. ^ Saritha Rai (14 July 2004). "A Religious Tangle Over the Hair of Pious Hindus". The New York Times. Retrieved 26 April 2009. ^ "Times of India – TTD Deposits Gold with SBI". The Times of India. Retrieved 13 September 2007. ^ My Amazing Life: Journey through Success. Partridge Publishing Singapore. 2013. ^ "Tirumala- The Paradise of Festivals". Retrieved 7 June 2015. ^ "Pilgrims throng Tirumala". The Hindhu. Retrieved 21 June 2015. ^ a b c V.K., Subramanian. Sacred Songs of India, Volume 10. Abhinav publications. p. 59. ISBN 81-7017-444-9. ^ a b "Tirumala Tirupati Devasthanams-Suprabhatam". Tirumala Tirupati Devasthanams. Retrieved 29 July 2015. ^ a b c Poet Saints of India. Sterling Publishers Pvt. Ltd. 1996. ^ 101 Mystics of India. Abhinav Publications. 2006. ^ a b c Srivari Brahmotsavam. The Hindu. 1975. ^ Encyclopaedia of Tourism Resources in India, Volume 2. Kalpaz publications. 2001. ^ a b Philosophers and Religious Leaders – Google Books. Books.google.co.in. Retrieved 17 June 2013. ^ Siddharth Varadarajan. Srivari Brahmotsavam: A celestial spectacle on earth. Kasturi and Sons Ltd, 2013. p. 68. ^ S. D. S. Yadava. Followers of Krishna: Yadavas of India. Lancer Publishers, 2006 - Ahirs - 185 pages. p. 99. ^ "S. P. Sailaja keeps audience spellbound". The Hindu News. 28 February 2012. Retrieved 2 March 2013. ^ S., Prabhu (10 May 2012). "Symbolising religious unity". The Hindu. Retrieved 13 October 2014. S. Krishnasvami Aiyangar (1939). A History of the Holy Shrine of Sri Venkatesa in Tirupati. Ananda Press, Madras. "Tirumala Temple History". Tirumala Tirupati Devasthanams. Retrieved 27 August 2015. "Sri Bhu Varaha Swamy Temple". Tirumala Tirupati Devasthanams. Retrieved 27 August 2015. "Sri Bedi Anjaneya Swamy Temple". Tirumala Tirupati Devasthanams. Retrieved 27 August 2015. Feminism and World Religions. SUNY Press. 1999. p. 48. Wikimedia Commons has media related to Tirumala Venkateswara Temple.